With a genuine concern about nature and the environment, all 41 villas in Keeree Waree are designed to be located in the spots where nature is least disturbed. 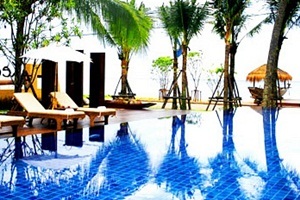 They are purposefully built to blend in with the surrounding beach, lotus pond, and indigenous trees and vegetations. Each villa has more than 60 square meters of living space, including a balcony. The three Grand Seaside Pool Villas offer the most spacious accommodation, with 126 square meters of living space including a private pool, and a private garden in each villa. 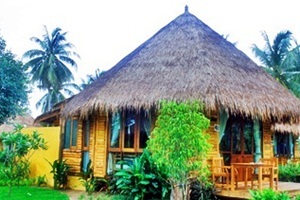 The external structure is of the Thai style back-to-nature design, using wood, wooden slabs, and thatched roofs. 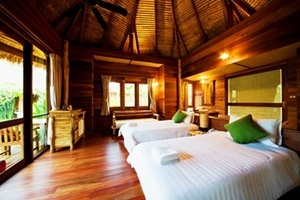 The interior decoration puts an emphasis on natural teak wood furniture, softened by local hand-woven cotton furnishing materials.Each villa is equipped with luxurious facilities, such as extra large indoor bathroom, outdoor shower in an enclosed garden, daybed, writing desk, mini bar, cable television, and telephone. Good morning, I have reviewed the accommodation and a few places yesterday. 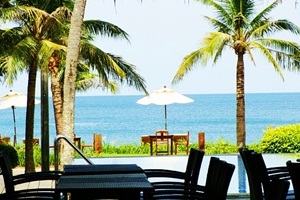 Today I was going to take you see the atmosphere around the resort and see how Baan Grood beach was. Let's go. In front of us was sea villa 6. It was superb designed as if it was in nature in every motion. Look at the sky it was still nice even though I heard the sound of thunder far away. Rest corner. Most of time we spent the day in the room because the weather was pretty hot. I thought that in winter time, the weather may be much colder. Walk out to our room, golf cart over there was fully charged of battery. Great! Next time, it'll use it. This was the side of sea villa6. It was a bathroom. The glass on the bathroom's wall was frosted glass. Absolutely it's save when you use the bathroom. Nobody can look over in. It looked perfectly harmonious between the house and the nature. Spa or Massage zone. This area was feeling us of shady. There was no clients today. We took this chance to take photo around. All decoration things had been put down in the right place got the touch of charmful feeling. We might be in love at this place already. Relaxation area in spa zone. Back wall was made of bamboo wood freshened us of the nature perceive. As I saw the resort surrounding, there was no any plastic, steel or unnatural materials used in resort decoration. This is spa rate. Go ahead for anybody is interested in using the service. For us, we didn't get the spa at this time. 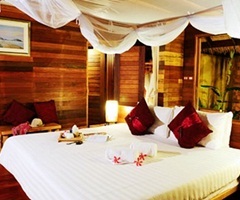 Just would to touch a feel of fresh environment and clam peaceful beach at this resort. Taking a walk in good weather of windy. The more we took the pictures, the more fun had been received. This zone is for doing activities. 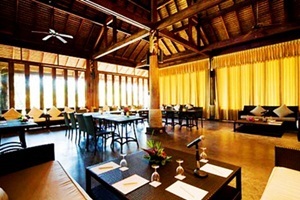 This resort welcomes of group seminar and everyone who comes in a large number of pax. They can do the activities altogether at this space zone. A hammock is available also. Let's leave from spa zone to chill at front of resort. See what other attractive things are arranged for guests. Golf cart for service all guests, but at time we arrived, battery was out! Golf cart is promptly park at the reception to service guests. A welcome doll stands at the reception. When you come to check in, you can see her. Give me a second to get my special friend to hang out. We are ready. We shall go having a walk on the beach. Weather was the perfect smoothened our vacation a lot. I took a quick shot of pool villa while the door had been opened. All swimming pool in this resort are used the sea water minimize your skin effected by chlorine. Evening scenery at the beach. There are a lot of living areas and many backgrounds for taking photo. Resort is on beach road. Just cross a road to enjoy the sea. It was peaceful in the evening. It is in fact no matter it is morning, afternoon or evening. It remained the peace and calm perfectly. Ban Grood beach is facing to the eastern side. We can obviously see the beauty of sunrise. How was such the clear sea water. It was suitable for your swimming in evening. A lot of teens enjoyed the sea water very much. We would be like that but was afraid of our beloved camera might get wet. So just stand and look at them. Her Samsung Note was fallen down to the sea...So sadly.. needed to take it to repair center. It's a good warning who loves to self-photo taken. Delicated sandy beach. We took off our shoes on the beach and barefoot to the lower beach. I felt myself that the sand was really completely delicate to my feet. Here we were the target. We just wished to take the photograph on many aspects. On the day we stayed, many beach chairs and table weren't arranged tidy as they displayed in the website. I assumed that there was a small party right here but nobody rearranged the place after party ended. The atmosphere was totally different what I saw from its website. The moon was showing up. That means it was time we had to back to our room. We kept well the good memory and took the deep breath of fresh air. This restaurant is used for breakfast and dinner. We intended to have a dinner in middle of candle on the beach side but our intention was failed because of untidiness of former party. I didn't understand the staff training system why they didn't show up to offer us the service when guests came to have seat already. We waited a big while but there were still nobody to take the order. We had to wave one of waitress to request the menu....In reality, they should at least have handed the menu to us? Shouldn't they? We collected more photograph while waiting for the food. We placed two glasses of drinks. One was blue gin and the other one wasn't sure the name what we had it. The taste was sweet and smelling good of fresh coconut. This serve was shrimp salad. Deep fried shrimp with mix veggie in special salad sauce. Fish with white sauce. White sauce was good but fishmeat was to rock like. Veggie was fresh and well clean. After the sun was risen up, we woke up to have a walk on beach front. What we found was bicycle rental fee 50 baht / one hour.... I kept in doubt why this resort level doesn't provide this complimentary for guests. It should be FREE in fact. And the unacceptable thing was the bicycle condition looked very very old aging. Everyone of them was rusty, color scratched. I didn't see even one person rented this service since we have checked in yesterday. Let's have a walk. We would be right back for breakfast here. What a pity, we didn't take the swimming in pool for this our vacation. There is one pool at the back of resort and the other one is at restaurant area. Its decoration is as if you are at your home. It has bookshelf, LCD flat-screen and telescope for guests. Surveying every corner for all of you. Another corner. I liked it. There was no pine tree at resort's beach front. The sun was lighting up. It was almost 7am....Time to have breakfast. Came back to inside the restaurant, apart from luxurious wine costs 7,500 baht per bottle, it had cocktail and macerated drug in alcohol in their concept too. Again, after we had a seat for a big while, there was nobody came to ask for order.... I knew that if I didn't ask for the menu, surely we wouldn't be given the breakfast.. I didn't like the service here. We ordered 2 serves of ABF, one running egg and scrambled egg. A waiter got in confused what we ordered but he nodded his head as if he understood what we wanted. Fresh fruit, nice butter. It was yummy having it with toast. It looked an orange juice but I didn't think it was. It should have been the pineapple juice but I wasn't sure of it. No matter what it was but I dared to tell you that it was extremely tasteless!! Good and soft bread. It had 2 toasters were provided. International breakfast.. Looked yummy and each dish was fresh and yummy as well... OK Well Done! Running egg was what my favorite. Dipping it with toast...Good taste. Our breakfast today. We unhurriedly had the breakfast and got ourselves ready to check out to return home. Breakfast at this resort has two options; One is American breakfast and Two is porridge style. After the breakfast, we took some more photo a short while and then packed up stuffs for checking out. We afterwards headed to Baan Grood Arcadia Resort stop over to take photo here. We didn't aim to rest and check in at all. Nice sigh, clean sea water. Perfect idea for photographing. It was time to say good bye to Baan Grood Beach. We both drove away to have a lunch at our favorite restaurant near Wha Kor. Just a short drive, U turn and turn left then. You will see the outstanding big sign in front of you. We were looking for the famous sour soup made of tamarind paste here. The most popular soup at this restaurant. Fantastic 80 baht. Big piece of squid. A sea villa room was a type we booked. After received the voucher confirmation from resort, it was quite excited to pack up stuffs and got prepartation to this journey. This was fried pancake sausage and egg. Pancake flour was really softy and crunchy :-) but the sausage was so bad smell. After one bite on that, I had to throw it away. It was only tiny meal in the morning. We prefer to heading to Prachuap. Before checked in at resort, we planned to make a merit at one temple names Wat PraMahathadchedi Pakdeeprakad After wander around the temple, we suddenly drove to the resort, our destination. Around KM.371 to the temple entrance. It's another 10 km from the entrance. You will be able to see the signs to the temple directions. Driving up here must be very careful because of steep road. For more moral purposes as the way of buddhists. It was hot on that day means the sky was so clear. It was perfect weather to take the pictures. We were sweating a lot but had a happy time together. This is a back corner of the buddha. We had walked around of the buddha as we wished. We had the other intention to walk up to merit on pagoda... Look up there. What such a sweat. No matter how hot it was, there were still a lot of tourists came to make a merit here. It was almost a half way we had walked. Look at that..a pagoda was outstanding far over there. Still far to reach there...kept going. Today, the sky was so clear. Unfortunately, the Nex 5n has no filter CPL on it, otherwise we could clearify our sky shot as we wished and whoever like the landscape. We firstly saluted to the buddha with golden flowers on 20 baht donation to the place, and walked inside to pray upfront. This area is forbidden for photograph. Baan Grood beach was such a nice calm beach unlike at Rayong beach. Let's see the surrounding together. Walked back to inside the pagoda. Whoever like this style of architecture, I am pretty centain that boring will be away. There are a lot of variety corners in many designs for taking photograph. It's worth to be up here. Personally, I'm thinking that Baan Grood Beach is quite beautiful. It is only just one hour away from Chaam, Hua Hin or Pranburi but weather and scenery are totally different. 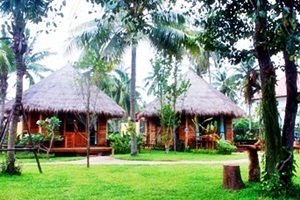 If anyone love the nature of peaceful beach, baan grood is the best choice of your nice vacation. It's only 4 hours drive away from Bangkok. It was almost 13.00. Time to walk down and get the nice lunch at Noo restaurant. One more pic before leaving. Stop to buy a bottle of driking water. It was 15 baht/bottle. 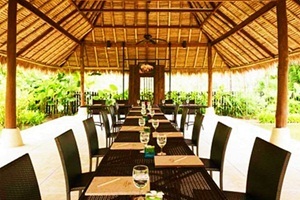 Time to head the Noo restaurant, Baan Grood beach. We had to be very careful when drove down from temple. The road is very steep. It's about 3 km away from this temple to Baan Grood beach. 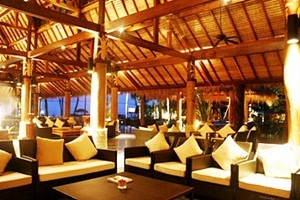 Here we were, Noo restaurant on Baan Grood beach. The weather was windy and chilled. We aimed to order the crab but unfortunately it was out. What a pity. My favorite food is stir fried crab with curry powder. Its price was 200 baht/dish. Taste was still good, wasn't change at all comparing to 2 years ago I was here. Although we ordered only 2 main dishes for 2 of us but we couldn't finish all of it. The quantity was so big, and too tired for long journey from this morning. 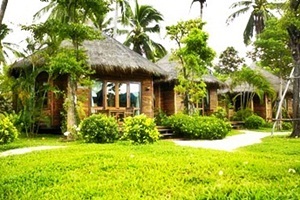 After lunch, we thus headed to keereewaree seaside villa & spa. This review is the review and our vacation in one combination. It's only 500 metres from Noo restaurant to this resort. Turned right to parking lot of resort. I prepared the voucher and bags handed to the receptionist. Our room was sea villa6 after took a short waiting. We felt a big disappointed that bellboy wasn't helpful. He didn't even assist me to carry bag. We thought that staff would take us a golf cart to our room but No... it became to transport us by this vehicle instead. The reason was golf cart ran out of battery...well...we had to try to get understand what we were acted. Disappoitedly, why he didn't help me to carry bag...This was the point I totally didn't understand at all. Eventhough our room was only 20 steps walk from lobby, it would be more impressive if resort staff had a good willing to assist guests in this aspect...Sadly they hadn't...Never mind. On the top left handside, there's a tiny gently curtain made as a wardrobe. This photo clearifies this room design and decoration. It looks comfy from my point of view. From verticle shot, eventhough there is an electric ceiling fan on the ceiling. Bedding was so softly, comfy and clean two towels. This is LCD TV corner. Unluckily the cable tv was broken on the day we stayed. It was unable to watch channel 3 and some of other channels. We had to miss some TV program. Living area. I loved this corner very much. This counch is really suitable to lay down after the exhausted day. A washbasin is placed at the back right of bed. A well placed of mirrow, hair dryer, toothbrush, etc. Mirror flame is made of wood which is compatible to the nature of this room. Left corner over there is a fridge, glasses, and a kettle. Light switch control is also right there on the back wall. We can turn it on and off the light easily. When we moved to it closer. 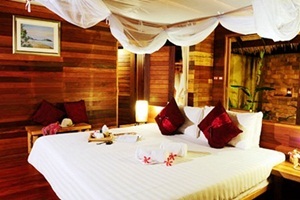 Bathroom is the main highlight of Sea Villa room. A comfy bath tub is placed at the back of room. It's well-replenished with rain shower as well. What a lovely bathroom! On the right is a toilet and shower is on the left. It has hot and cold water for us either. Tonight I will let myself soak in warm water. It's outdoor bathroom in which some people may be afraid of peeping. Don't worry, it's quite safe. Size of tub is quite large enough for 2 persons in it. It does work to be a part of good highlight of Sea Villa room. Bathroom is gorgeous decorated. The left side mirrow is the transparent visible to yard outside. This is a tissue box.... What a wonderful design it is..
Shower room. I give a 100 points for bathroom. Washbasin is right at the back of bed there. It looks like a rice plate, doesn't it? A lof of things were beautiful freshened me forgot the smelling of dust. Just thought of bath amenities hadn't been taken photo. It's equipped with shower room and bath amenities in bathroom. Been busy on arranging some skincare. Hahaha..nice background! These were all lovely things in our villa. We afterwards would go out for a walk outside.. Would see what they had for the photo taking. See you next part.